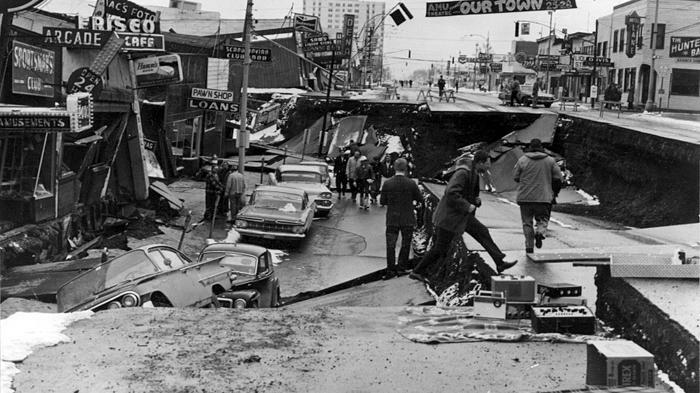 Fifty years ago this evening, a magnitude 9.2 earthquake rumbled deep and long in Alaska’s Prince William Sound, severely damaging Anchorage and triggering a tsunami that killed more than 100 as it struck the coasts of Alaska, Oregon, and California. “The earthquake lasted approximately 4.5 minutes and is the most powerful recorded earthquake in U.S. history,” says the U.S. Geological Survey, which has compiled a 50th-anniversary retrospective of the Great Alaska Earthquake and Tsunami with seismic data and hundreds of photos. In the Ring of Fire, it’s only a matter of time before the next big quake—and its potentially resulting tsunami waves. But there are steps you can take to prepare your family to survive the shaking and subsequent damage until help arrives. Store your kit in a big trash can or cooler on wheels near a ground-floor door or in your yard—or in a shed, so raccoons can’t break in and party with your supplies. Keep your camping gear nearby and you’ll have access to temporary shelter, sleeping bags, lanterns, and your gas camp stove. And when a quake hits, NERT and many other earthquake-awareness groups still advise that you drop, cover, and hold on. If you live near the coast, don’t take chances—take steps to be prepared.